Yesterday I gave a successful talk at the Way of the Whales Workshop, which was hosted by Orca Network and was down on Whidbey Island. They had about 120 people show up, which is great! I have heard Whidbey Island is beautiful. I was suppose travel through last summer when I was on vacation, but canceled to stay the whole time on San Juan. 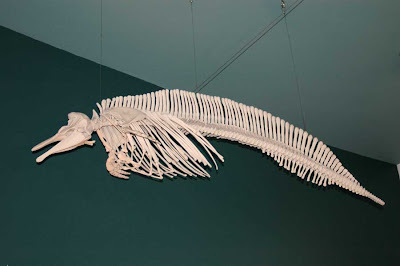 Thanks for showing the Dalls Porpoise skeleton. It's interesting as I didn't realize their body were shaped that way. Not sure why, but I have only seen them a couple of times in the last ten years. Michele, if you're driving up from down south a nice route to take instead of going straight up I5 through Washington is to cut off at Olympia and head up the Olympic Peninsula and Highway 101. There is a ferry from Port Townsend to Keystone on Whidbey Island (although with the Washington State Ferry craziness it sometimes doesn't offer car service so check ahead). 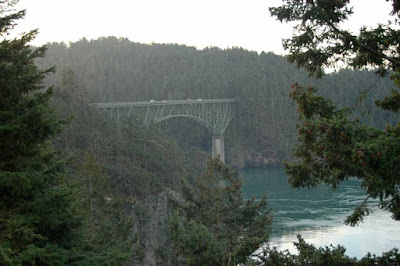 Then you can drive up Whidbey Island, cross the Deception Pass Bridge to Anacortes, and take a ferry to the San Juans. It's BEAUTIFUL scenery the whole drive, much better than the I5 corridor, and that way you can still maximize your San Juan Island time. How many of you get gulls at YOUR feeders? What is this middle-of-the-night mystery sound?